We arrived home from our Disney Cruise vacation on Saturday. Settled in and turned down the air conditioner since we had turned it off while we were gone. The house cooled down but at 4am I woke up sweating. I walk over to the thermostat to check the temperature and it was blank. Ok, what does that mean? I started to take it apart to look for a battery. No battery. Then I headed to the garage to check the breakers to see if one had flipped. Nope. Then hubby wakes up. Immediately gets excited and says, “Oh if it’s broken we’re getting a Nest“! Surely he was just delirious since it’s 4am. I mean he didn’t really want it to be broken right? 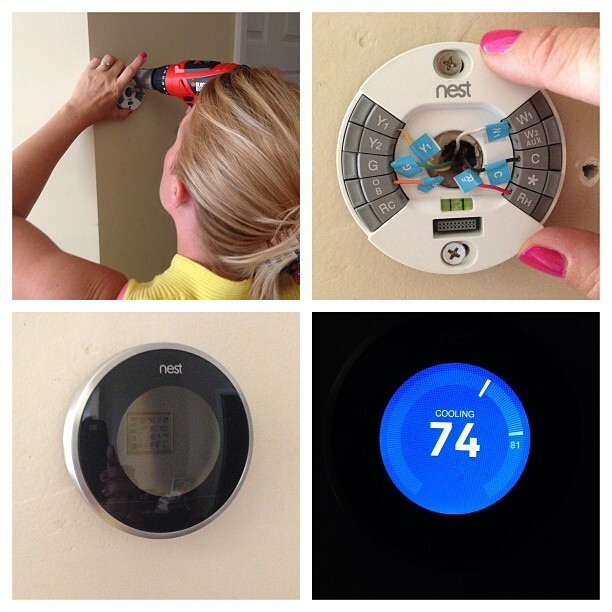 Sunday the sun came up and we headed off to replace the thermostat with a Nest, before it reached 90 in the house! I will say it’s not a cheap item. However it boasts about saving 50% or more on your energy bill. Only time will tell. Installing it was so easy I was done in under 10 minutes. However, once installed it didn’t come on. 🙁 That meant there was another problem. Hubby and I did more research and took apart a few parts to our air conditioning unit, to no avail. We’ve learned over the years to try to troubleshoot a problem ourselves before we rush into calling a repair company. When we moved into our first house we called a repair company only to have them tell us we needed a new air filter, now please pay us $88. UGH, you live and you learn. We did call Chase Air and leave a message. Not expecting to hear from anyone till Monday. However they did call us and walked me through checking a few things. Including the float switch and the fuse which we had looked for already, just in the wrong spot. Both were good. (Can’t say enough about customer service like that!) I’ll be calling them for future repairs. Off to Home Depot to get a multimeter and test the wires in the thermostat. Each registered voltage so we knew they were not the problem. We walked away for a while and eventually hubby took the nest and plugged it into a USB cable (it’s a smart thermostat) and it came on. There was a reset button and once we did that, it started working! The Nest can be controlled from your computer or smartphone! Turning down the A/C when you are already in bed, or before you arrive home from a week long vacation will be awesome! It learns your habits and helps you save energy. I’m excited to see how it does and if it truly adjusts the temperature when no one is home.